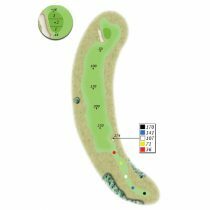 Medium length downhill par 4. Good drive over right bunker should leave a mid iron to the green. An easy carry over the right hillside bunker will find a blind landing area revealing the shortest route to the green. Challenging this line minimizes the left greenside bunker on approach. If driving safely to the left, aim for the lone elm tree in the distance, but be ready to carry the greenside bunker on your second. Long downhill par 4. Drive over white rock will leave a long iron or wood to the green. 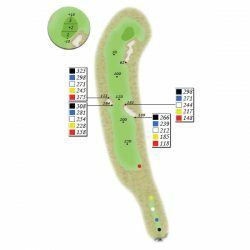 A very long par 4. Successfully challenging the bunker on the left offers a down slope that will kick forward and position second shots away from the right greenside bunker. Approach shots left of the bunker are held by the left-to-right sloping green. Short par 5. Good drive over the fairway bunkers will leave a long iron to an elevated green. This reachable par five offers multiple scoring opportunities. 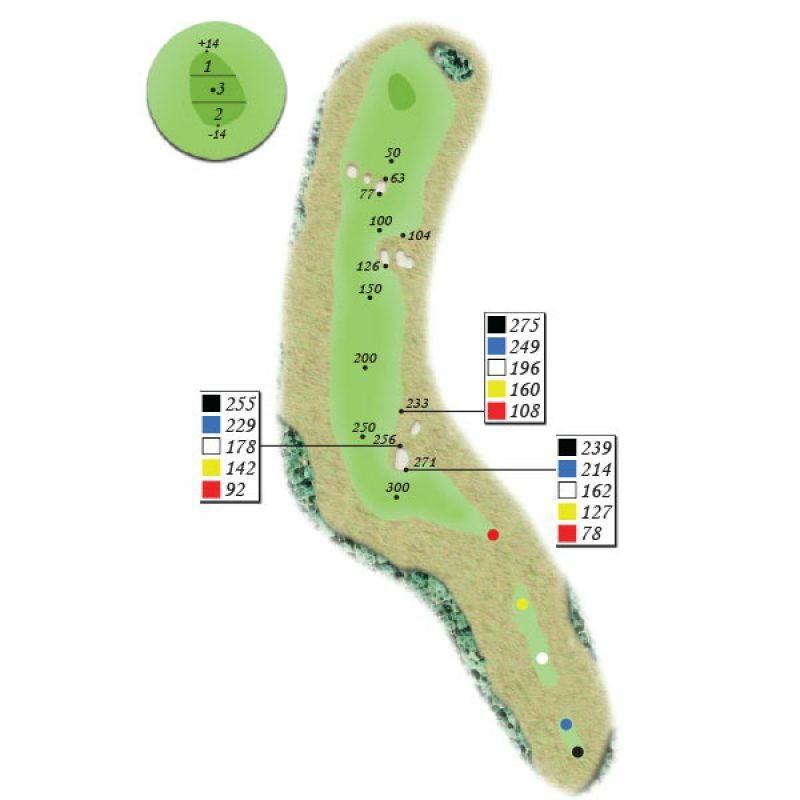 Challenging the right side bunkers shortens the hole, allowing a chance to get home; but choosing the safety of the left side off the tee tightens the second landing area. The small naturally perched green demands accuracy on approach, as missed shots fall off in all directions. Medium length uphill par 4. Drive between the bunkers should leave a mid iron to an exposed green. 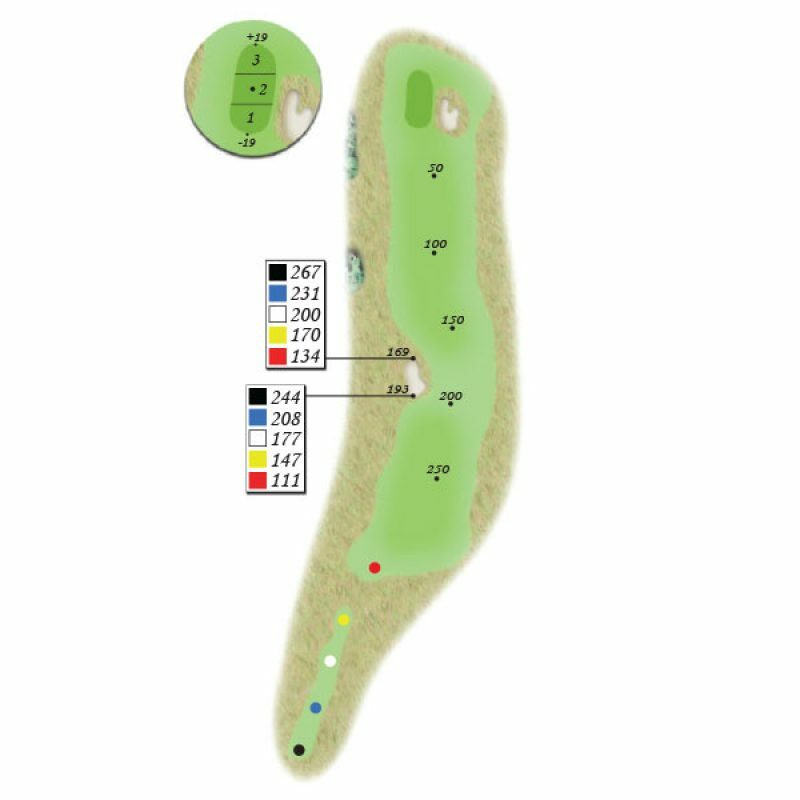 The hardest hole on the front nine is best played the long way. 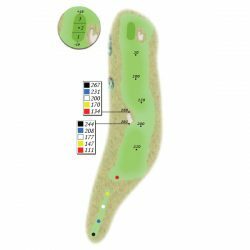 Attacking the outside of the dog leg with a long drive can gain an unobstructed run-up to the green. 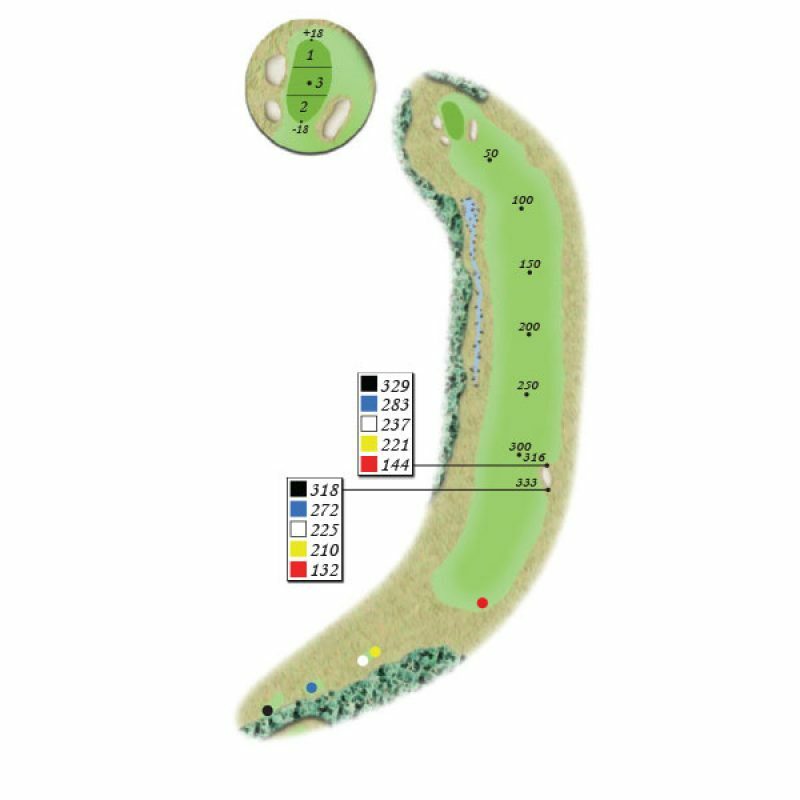 The short route offers room to miss off the tee, but bunker-protected pins will challenge second shots. Medium length steep par 3. A mid iron to middle of green will leave player in good spot. 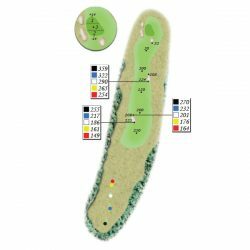 Severely uphill, the yardage on this par 3 is very misleading. Take two or three extra clubs and trust the right greenside slope funnels balls towards the putting surface and the slope behind the green backstops long shots. Take two or three extra clubs and trust the right greenside slope funnels balls towards the putting surface and the slope behind the green backstops long shots. Long downhill par 4. Drive over left bunker leaves a mid iron to green. 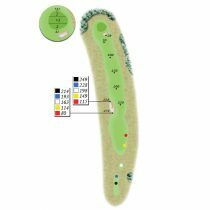 The dramatic 45 foot elevation drop lengthens drives and shortens the yardage. Favoring the left side along the wetland bunker leaves a clear approach to the green. 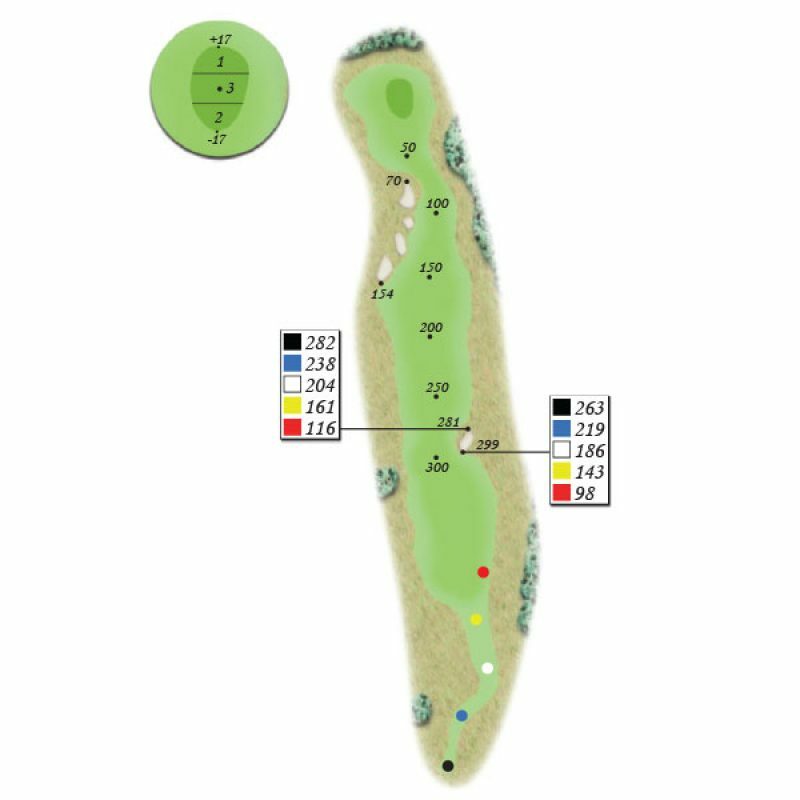 Avoid the right greenside bunkers and utilize the left slope to safely reach the putting surface. Medium length downhill par 3. Only hole without bunkers on the course. The only hole at Sage Run without a bunker; this medium length par 3 is no pushover. 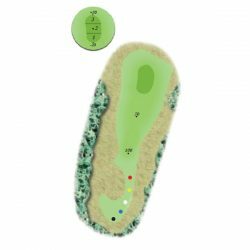 The tricky green is protected by slopes that repel the ball, so a precise shot is required. Short uphill par 4. Hole can be driven if shoot at the flag or play right of the tree with an iron and a wedge. This uphill, drivable par 4 tests risk-reward tolerance. 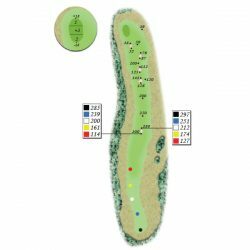 The split fairway imposes a choice between a potentially green reaching but blind shot left, or a controlled layup from which to attack the well-bunkered green. Factor the elevation change into club selection. Medium length downhill par 5 – Aim over the bunkers on the left to get there in two or play as a three shot hole. 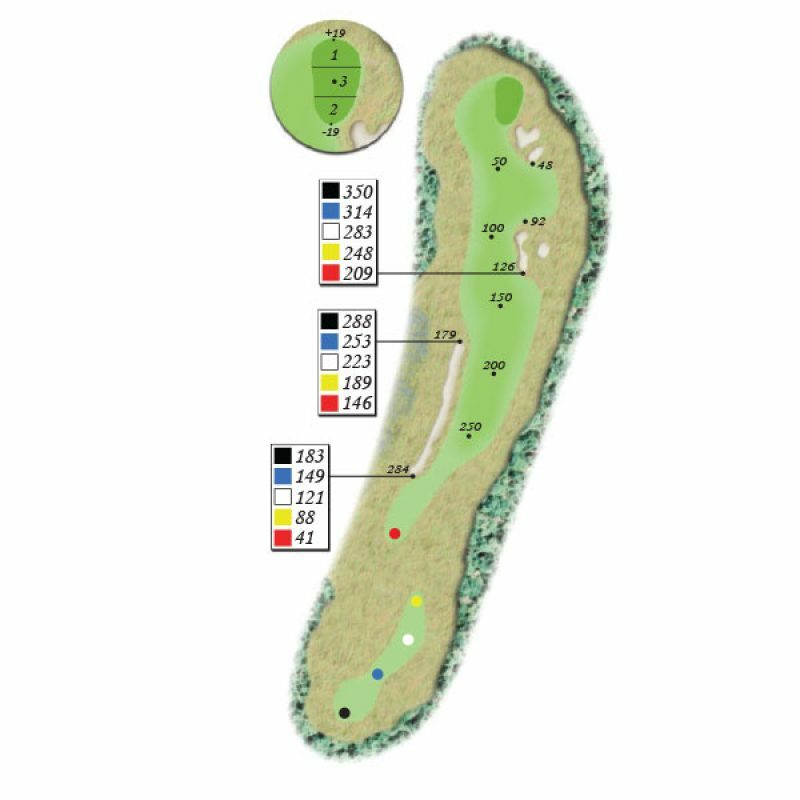 Playing gently down the scenic top of the ridge, this par 5 is reachable by navigating the right bunker off the tee and threading the neck of the second landing area with a downhill roll to the green. Alternatively, a safe drive toward the tree makes this a three shot hole. 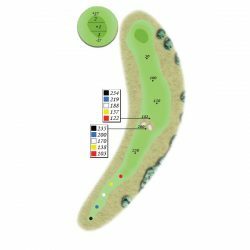 The fairway narrows closer to the green, so balance layup yardage and accuracy. 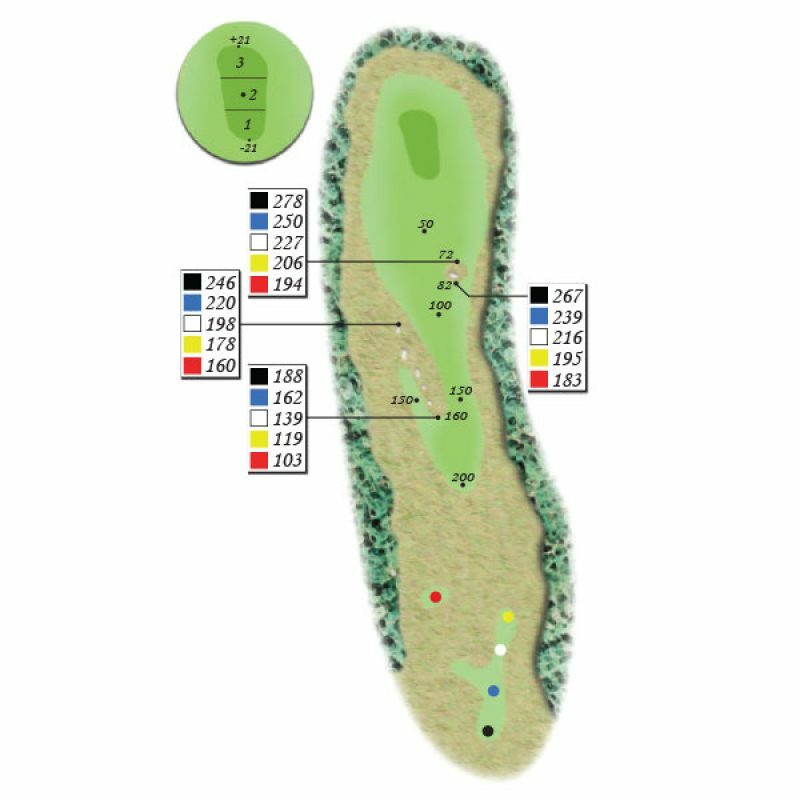 The back-to-front sloping green is receptive yet penal to long shots. 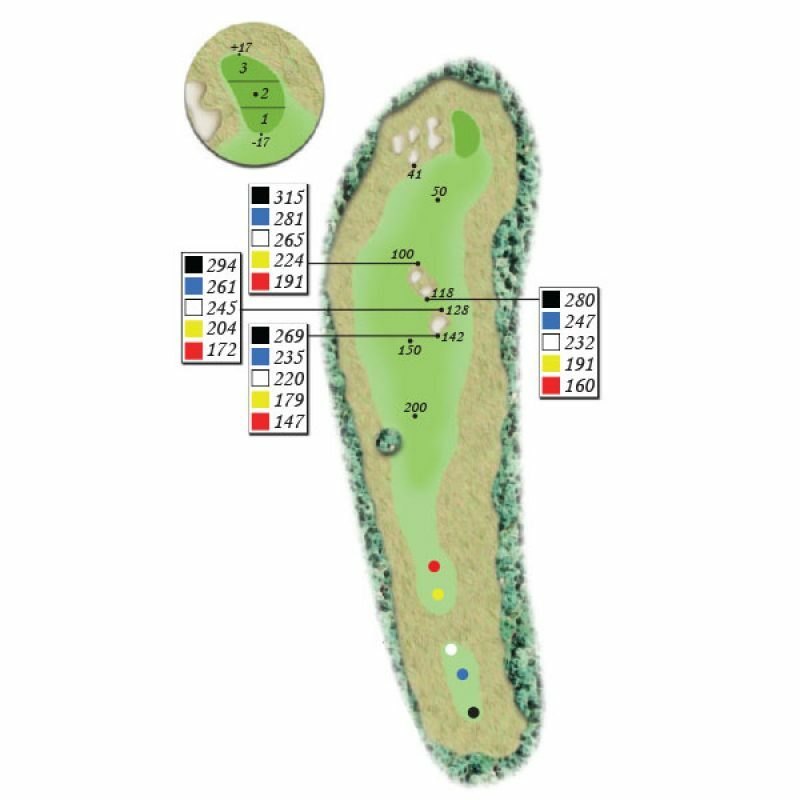 Medium length downhill par 4 – Drive over the left bunker for a short iron to the green. The angled fairway bunker tempts long hitters to skirt the corner leaving an approach that aligns with the length of this long, narrow green. Tee shots right find ample fairway but bring the right greenside bunker into play. Finding the putting surface is important, as the green surrounds leave tricky recoveries. Short downhill par 4 – Draw your tee shot over the bunkers for a short iron to the green. Two fairway bunkers intimidate off the tee, but generous fairway lies beyond. The bunker-less green is blind from the landing area but receptive to run ups that crest the fairway approach. Aggressively cutting the corner shortens the hole and improves visibility of the tiered green. 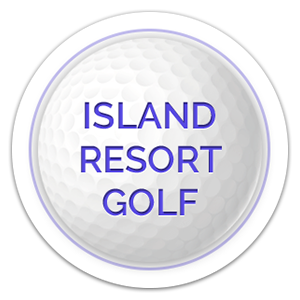 Long par 5 – Keep your ball on the left side of the fairway for a good third shot to the elevated green. 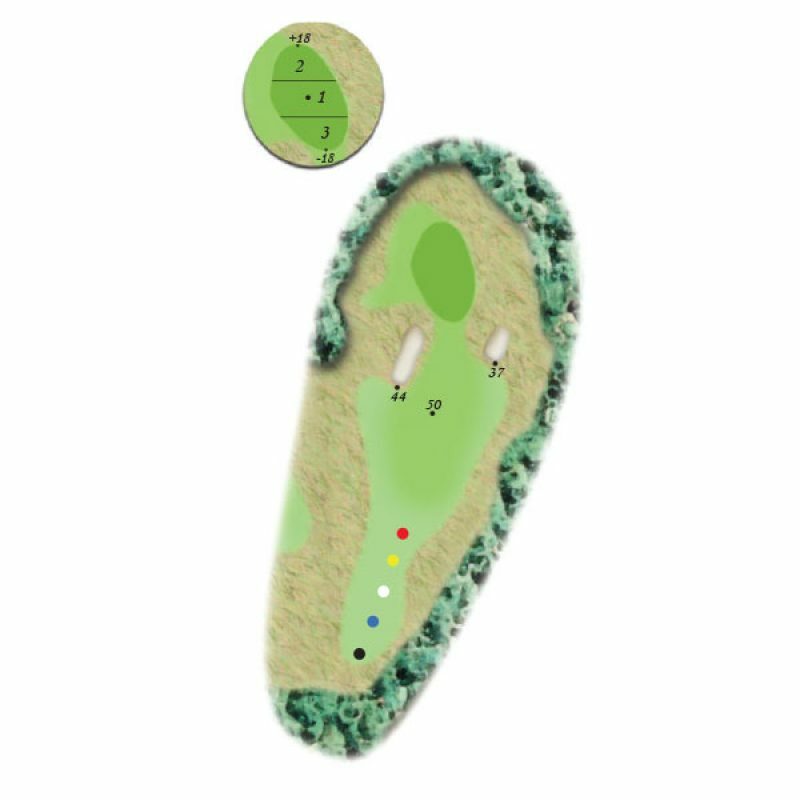 This dual-fairway, long par 5 provides options. Navigating the fairway bunker off the tee initiates the strategy. Testing the tighter upper fairway with the second shot yields an approach to a similarly elevated green. Utilizing the wider lower fairway, while safer, leaves the difficult test of an uphill approach over hillside bunkers to a blind putting surface. Short uphill par 4 – Good drive right of the fairway tree leaves a short iron to an elevated green. Favoring the right side of the fairway yields the best angle into the green. While the left side is open and inviting from the tee, the resulting approach is difficult to hold with a green that falls away on three sides. 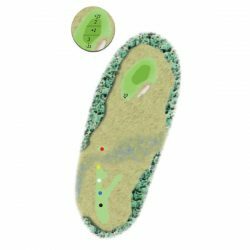 Long uphill par 3 – Play longer than the distance on the card to the middle of the green. Plenty of room behind the green. This long, uphill, par 3 plays over wetlands to the largest green on the course. While hidden from the tee, a generous collection area around the green provides room to be aggressive. Take enough club, anything short of the green is trouble. 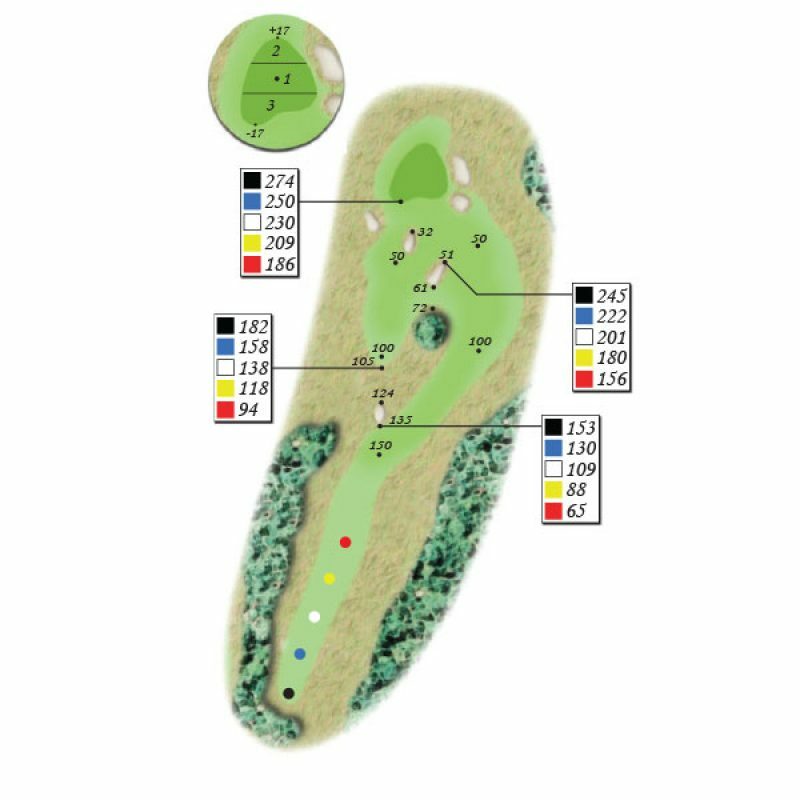 Long downhill par 4 – Good drive over the left fairway bunker leaves a mid to short iron to heavily bunkered green. Short uphill par 4 – Driver to middle of fairway leaves a wedge or short iron to largest green on course. There is more room than you think. Drive over the right fairway bunker to a blind but sizeable upper fairway sloped towards the bunker-less green. Safe drives short of the bunker encounter a tricky approach shot to a thin backward sloping green. 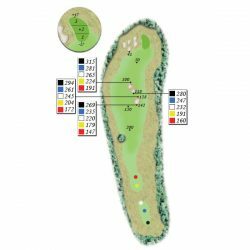 Short par 3 – Play the listed yardage to middle of the green. Set on the edge of the ridge’s steep slope, the shortest hole on the course requires a precise shot. 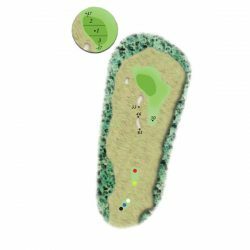 Carry the bunker to the generous green behind or risk going right of the bunker through the narrow approach. Long downhill par 5 – Good drive left of the fairway bunker gives the option to go for the green or layup to middle of the fairway. Utilize the largest elevation change to drive left of the fairway bunker. A short clean approach to the green requires a second shot that challenges the rock creek that guards the left side of the landing area.